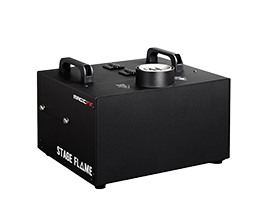 Stage flames, flambeaux, hand held torches, gel burners and many other flame effects are available to hire. Stage Flames bring shows to life and really can draw the audience into the performance. Spectacular to watch they also add another dimension with the radiated heat of the flames bringing crowds even closer to what's happening on stage. On stage, at festivals and for TV and music videos, stage flames are our most requested flame effect hire. Able to produce fireballs and flame jets from 3m to 7.5m these excellent units are DMX controlled with a built in safety channel to prevent accidental firing. 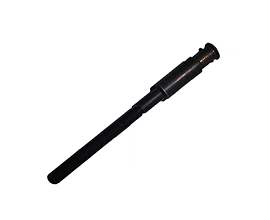 They can be used with either internal cartridges or from propane cylinders (or a combination of both to give the biggest effect). Perfect for one-off events or tours, these machines are spectacular, responsive and very easy to control, yet still easy to rig and de-rig. They are also ultra reliable making them a joy to tour with. These are a versatile system and we have used them as much off stage as we have on! In barrels on barges and for corporate events. The application for this effect is endless and always a popular favourite. We prefer to supply these units with an experienced technician, but we will dry hire to professional users. 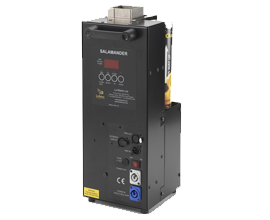 The Salamander is a DMX canister based flame system producing spectacular flame columns or balls in fast chases. They produce coloured or natural flames ranging in height from 4m to 6m, canister-based fuels offer an ideal solution for anyone wanting to create a propane-style flame without the headaches. They eliminate the need for inconvenient external propane tanks, trailing pipes and multiple valves, enabling quick set-up and at a fraction of the cost. 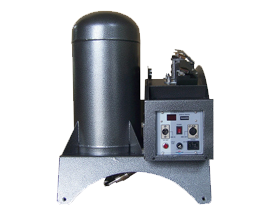 A single fuel canister will provide up to 30 seconds of continuous flame or almost 50 flame balls. Colours currently available are natural, red and green. 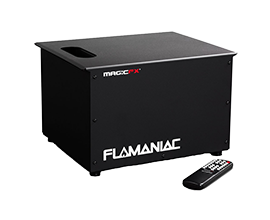 Flamaniacs are the 5 finger liquid flame system, which can be used in and outdoors to create a jawdropping effect. Using DMX you can create chases across the unit or across multiple units. The Flamaniacs are available in 4 colours, red, green, yellow & orange flame. Each liquid flame jet spans 6m on each point. 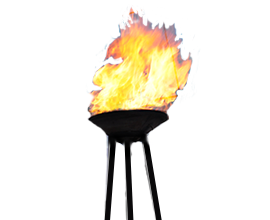 Liquid flame systems are becoming more & more popular with outdoor sporting events, festivals & big arena shows. We have straight & fanned flame systems ranging from 10m - 15m flames in standard orange flame or available in red, green or blue with tank sizes ranging from 16lt to 30lt. These units are hired out with a technician to rig & run them. Path Marker Torches are an elegant effect to light a pathway driveway or entrance. The Path Markers can be staked into grass or onto our custom concrete bases, They can come in various heights to suit the venue/event. They use internal gas cylinders which lasts up to 3.5 hours depending on flame height making them incredibly easy to use. Perfect for adding atmosphere and light to outside areas Flambeaux's are a great way of emphasizing an entrance way, giving atmosphere to a VIP area or to add something special to a marquee or a red carpet event. Our Flambeux are 7ft in height & can produce a 2ft flame. They are run using propane gas which hides away in the bottom compartment keeping a neat unit. Because of the size of the Flambeaux's these are normally collection only or delivered with our technician. 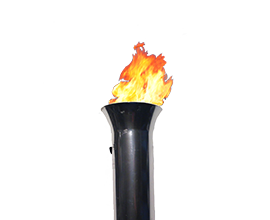 Our real flame procession torches are a great solution for use both on stage and outdoors. Each torch has a built in safety mechanism so that if a torch is accidentally dropped, the cover pops up and extinguishes the flame safely. Fuel is 'Flame Paste' a semi solid fuel that doesn't drip and which is available in 1 or 5 litre cans. 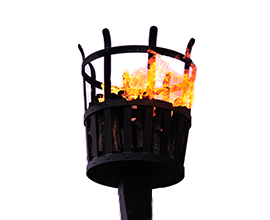 Each torch take a full fill of approximately 75ml which will burn for around 10 minutes. 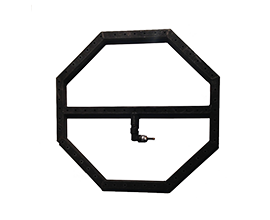 We have various flame bars and rings available to hire in all sorts of shapes and sizes, with and without ignition systems and controllers. Great for one off photo shoots and for longer hires, flame bars can be built to your specification and dimensions and can be built into fire trays and stage mounts. Another bespoke flame creation has made its way into our hire department giving a huge 15ft Flaming Beacon available to hire. 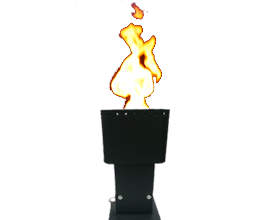 It comes in 3 parts giving it a variable height & an easy ignition system from the base of the flame ignites the propane to produce a 4ft flame which can be regualted down if needed.